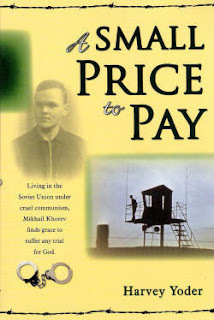 Lighthouse Trails is pleased to announce the release of their latest book, The Gospel in Bonds: 8 years in the soviet gulags—imprisoned for his faith by former Soviet prisoner Georgi Vins. A Soviet government tried to extinguish God’s Truth by placing its messengers in bonds. But the light of God’s Word and its hope of salvation could not be destroyed even in the darkest prison camp. But in the pages of this book, you won’t read about a man who felt sorry for himself or who wallowed in the misery of his sufferings. Rather, you will hear the true stories of believers whose faith in Jesus Christ took preeminence in their lives and who allowed nothing, not even a Communist government, to take away their faith and their hope. Threaded through The Gospel in Bonds is an intricately woven theme of love for God’s Word and faith in the Gospel, even in the midst of severe punishment and deprivation. May the pages of this book give you insight into the mind of a man uniquely used by God and encourage you to an ever-closer walk with the Savior, Jesus Christ! To order The Gospel in Bonds, click here. ALL BACKORDERS HAVE BEEN RELEASED.